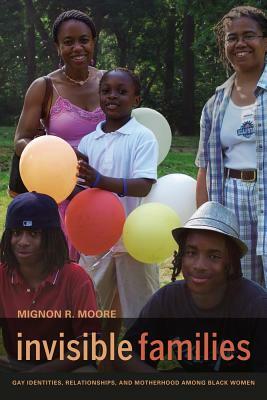 Mignon R. Moore brings to light the family life of a group that has been largely invisible—gay women of color—in a book that challenges long-standing ideas about racial identity, family formation, and motherhood. Drawing from interviews and surveys of one hundred black gay women in New York City, Invisible Families explores the ways that race and class have influenced how these women understand their sexual orientation, find partners, and form families. In particular, the study looks at the ways in which the past experiences of women who came of age in the 1960s and 1970s shape their thinking, and have structured their lives in communities that are not always accepting of their openly gay status. Overturning generalizations about lesbian families derived largely from research focused on white, middle-class feminists, Invisible Families reveals experiences within black American and Caribbean communities as it asks how people with multiple stigmatized identities imagine and construct an individual and collective sense of self. Mignon R. Moore is Associate Professor of Sociology at the University of California, Los Angeles. “Invisible Families represents sociological research at its finest. . . . Well written and theoretically sophisticated. . . . This is clearly a groundbreaking book. "Scholars and students of race, class, gender, sexuality, [and] family . . . will benefit greatly from this comprehensive work."